Strangest fact: The “tamán shud” paper was torn out of an extremely rare poetry book. Local librarians identified the phrase as the last two words of Rubaiyat Of Omar Khayyam, a book of poems from a 12th-century Persian poet. Police conducted a nationwide search for the book, and a man (who wished to remain anonymous and is known only as Mr. Francis) came forward saying that he found a copy of the book in the back seat of his car around the time the body was found. The book was missing the words “tamán shud,” and had several lines of seemingly random capital letters penciled onto the last page, which are believed to be a code. Somerton Beach. The X marks the spot where the body was found. Thing we were happiest to learn: The mystery didn’t end with the stranger’s burial. The receptionist at the hotel nearest the spot where the body was found came forward, claiming a strange man was staying in the hotel at the time of Somerton’s death, carrying a black case with a long needle inside. Years afterward, someone (or someones) started leaving flowers on Somerton Man’s grave. Police questioned a woman leaving the cemetery, but she pled ignorance. There have also been numerous attempts by codebreakers of every stripe to solve the riddle of the letters in the Taman Shud book. Some believe the final string of letters, ITTMTSAMSTGAB stands for “It’s Time To Move To South Australia Moseley Street.” This jibes with another strange turn in the case—a phone number was written in the book, belonging to a former army nurse who lived on Moseley St. (She requested anonymity, and has been identified as “Jestyn,” a signature found in the book.) She claimed she had a copy of the book, but had given it to a Lt. Alfred Boxall, who she had served with. For a time, Boxall was thought to be the dead man, until he turned up in 1949 with his copy of the book intact. Thing we were unhappiest to learn: While Boxall’s connection to the dead man was tenuous, he still came under a great deal of suspicion. People began speculating that Boxall was working for military intelligence, and Somerton Man was a Soviet spy poisoned by Boxall or some other agent. Boxall himself dismissed this as “quite a melodramatic thesis.” He was in fact an engineer in the 4th Water Transport Company, and if he spent any time spying, there is no evidence of it. Also noteworthy: In 2009, University Of Adelaide professor Derek Abbott attempted to solve the long-dormant case. His theory on the code letters is that they were a one-time pad code, thought to be unbreakable, because it’s based on a particular document as the key. His theory is that the Rubaiyat is the key, but the edition of the book Somerton’s scrap of paper came from is so rare, no one has been able to find a copy to confirm Abbott’s theory. With the original autopsy report lost, and the government unwilling to exhume the body, Abbott was still able to analyze photos of the dead man, and discovered two strange things. His upper ear was strangely shaped, in a formation shared by less than 2 percent of Caucasians, and he had hypodontia, a condition in which one more more teeth fail to develop, also present in less than 2 percent of the population. These odd features wouldn’t prove anything on their own, but Abbott examined photos of Jestyn’s son, who had the same-shaped ears, and apparent hypodontia. The chance of two unrelated people having both conditions is more than one in ten million. Eventually, Jestyn the nurse was identified (probably) as one Jessica Thomson, whose daughter Kate told 60 Minutes in 2013 that her mother had known Somerton Man, and that they both may have been spies, although she had no evidence of that. Jessica Thomson’s son, Robin (who passed away in 2009), had a daughter, Rachel, who suggested that Somerton Man was in fact Robin’s biological father, as Abbott’s theory suggests. In a strange twist, Rachel Thomson ended up marrying Professor Abbott. The two have petitioned Australia’s government to exhume Somerton Man to confirm the DNA connection, but thus far the authorities haven’t agreed. 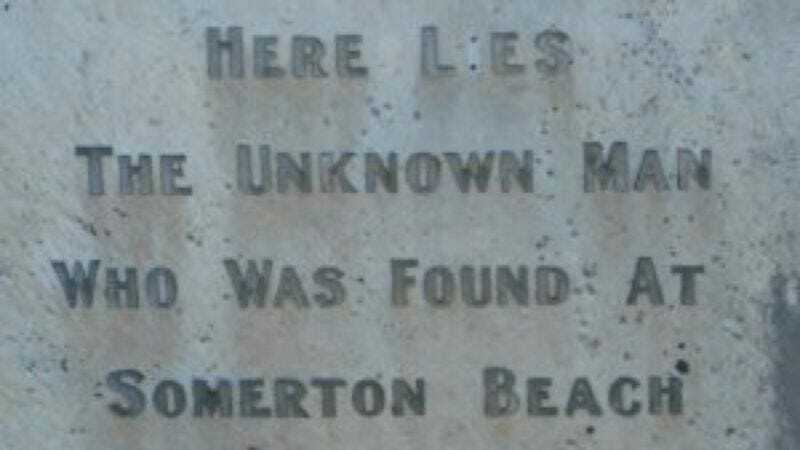 Best link to elsewhere on Wikipedia: Somerton Man is just one in a long, long list of significant unsolved deaths. The victims on Wikipedia’s list range from mafia figures whacked by unknown enemies, to celebrities like Natalie Wood and Biggie Smalls, unsolved serial killers like the Zodiac Killer and Jack The Ripper, historical figures like Alexander The Great and England’s William II, and a long string of John and Jane Does who met an unfortunate end. Further down the wormhole: Much of the Somerton investigation focused on the Rubaiyat, but the poetry collection has had a wider impact, as phrases from various poems have been reused as story titles by Eugene O’Neill, Agatha Christie, and Rex Stout. Stout is best known as the author of the Nero Wolfe detective novels, but he was also a public intellectual, who could often be heard on the radio during World War II, discussing the war. He shared one such discussion with novelist Marcia Davenport, whose 1954 book My Brother’s Keeper was based on the lives of the Collyer brothers, a pair of eccentric shut-ins and hoarders whose bizarre practices captured the public’s imagination. We’ll sift through their mess next week.